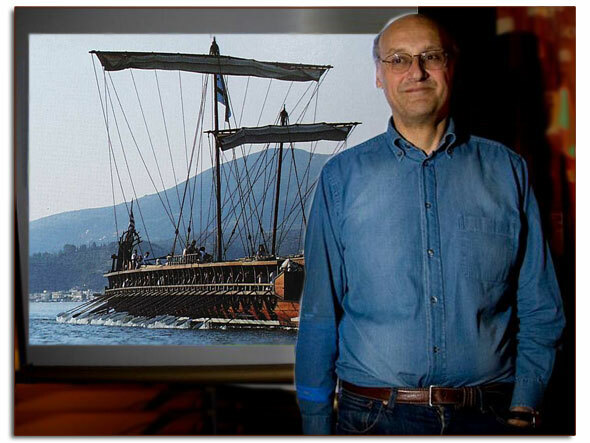 Despite freezing temperatures outside, Boris Rankov, professor of ancient history and Wootton resident, lifted everybody's spirits with a magisterial talk on Friday, December 5th about the construction and trials of a Greek trireme, a wooden ancient warship, in the warm and deep-blue waters of the Aegean Sea. It was a fascinating insight into the vision of the academics and naval architects who persevered with the project over several years, with the 45-tonne ship costing £750,000 to build before it took part in a series of trials with 170 rowers from around the world. The trireme, called Olympias, was commissioned into the Greek Navy in 1987 and there are now plans to possibly ship it to New York for a Hellenic Week and even dreams of an appearance at the London Olympics in 2012. A measure of the evening's success was that questions for Boris just kept coming from an audience eager to know more and many of us were left envious of those in the crew - both men and women - who had taken part in this landmark venture. We watched some of the original trials in about 1992 with the trireme in Poros and Boris's talk brought back all the excitement of those times when we saw the Olympias being pulled through the water with such majesty. It was a very evocative talk and it was delivered with such infectious enthusiasm that it made a wonderful evening....the talks so far have all been so varied and yet so compelling in their own way - George and Sue Doucas.